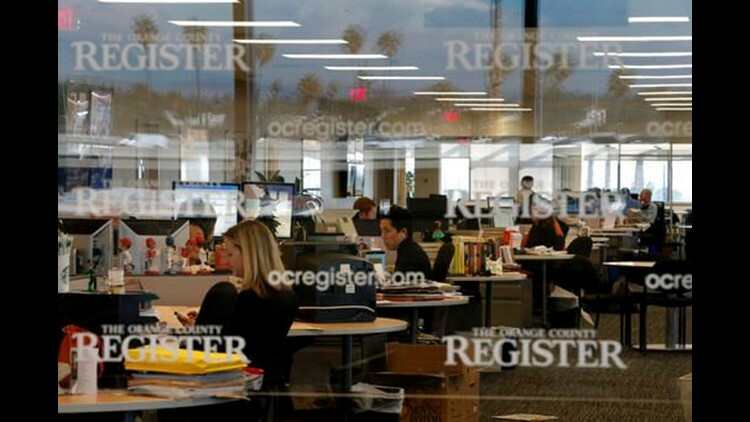 SANTA ANA, Calif. (AP) — The federal government filed an antitrust lawsuit Thursday in an attempt to block Tribune Publishing from buying the bankrupt Orange County Register and Press-Enterprise newspapers in Southern California. The suit was filed in federal court hours after Tribune, which publishes the Los Angeles Times and San Diego Union-Tribune, announced it had placed a winning $56 million bid for the two newspapers owned by Freedom Communications. The sale would give Tribune a monopoly over newspaper sales in Orange and Riverside counties and allow it to increase subscription prices and advertising rates, U.S. Justice Department said in a statement. A federal bankruptcy court judge still must approve the sale and has set a hearing for Monday. A message seeking comment was left for Tribune. The sale would string together the biggest newspapers in each of four Southern California counties with a combined population of 18 million, consolidating control over news and advertising in the region. "Communities benefit by having different groups of editors looking out for them," said Ken Doctor, a media analyst. "When you essentially only have one newsroom leadership deciding what is news for Los Angeles County, Orange County, Riverside County, San Diego County, that is unprecedented." Freedom Communications sought bankruptcy protection last year. The move came three years after the Register embarked on an aggressive expansion of print journalism that included starting daily papers in Los Angeles and Long Beach and buying the Press-Enterprise for $27 million. Tribune was competing to buy the two newspapers against an investor group led by Freedom's current managers and Digital First Media, which owns nine Southern California papers and websites, including the Los Angeles Daily News. Digital First, which submitted a $45.5 million "stalking horse bid" for the papers, and Tribune saw buying the papers as a way to expand their territory and save on costs. The Associated Press is among the creditors in Freedom's bankruptcy proceedings.